The creation of a new rail authority for the South East would improve train services for passengers, according to a report published on Tuesday. 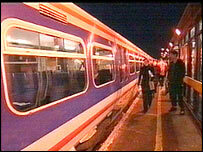 A study showed a third of journeys to and from the capital in the south east extend further than Greater London. A Greater South East Rail Authority would set timetables, regulate peak fares and set train operator contracts. The Institute for Public Policy Research (IPPR) said the authority should work alongside Network Rail. The institute, which commissioned the study, said that with the planned abolition of the Strategic Rail Authority, announced by the government last July, Transport for London had argued for greater influence over passenger services within Greater London. "Given the strong passenger rail links between London and the greater south east it is questionable whether the responsibility for franchising services should go exclusively to the Mayor," said spokeswoman Julie Foley. "We think responsibility for passenger services should be given to a new Greater South East Rail Authority." The report makes three other recommendations to improve transport in the South East. Introduction of national congestion charging in the next 10 to 15 years on condition that there is significant investment in public transport. Measures to reduce car trips and encourage use of public transport, walking and cycling, including travel plans for businesses and schools. Prioritising the interests of cyclists and pedestrians through better urban planning and speed management. It also calls for a single regional board to advise the government on housing, planning and transport.